The second outfit is my favorite, the colors are so elegant and the necklace really compliments the whole look. I've always loved you in blue. It suits you so much. Wonder if that's some subconscious thing because of your blog name, haha. Hope you had a lovely weekend. Great styles, I really like the print on the dress! Happy Monday Mica! Very pretty office looks. I love how a blazer instantly transforms a look to polish and professional. I pray you have a wonderful new week. Your outfits are flattering as always! I love the second dress, it is so soft and lightweight. That tote really does go with everything and is so roomy. I love how it looks with your blue! Thanks! It really does go with everything. Such pretty printed dresses! And I love the LV bag review! A Neverfull is on my wish list! I love how you are finding the cutest blue printed dress! I really like the print of the second one and how it has a blue grey color! Very pretty and flattering! 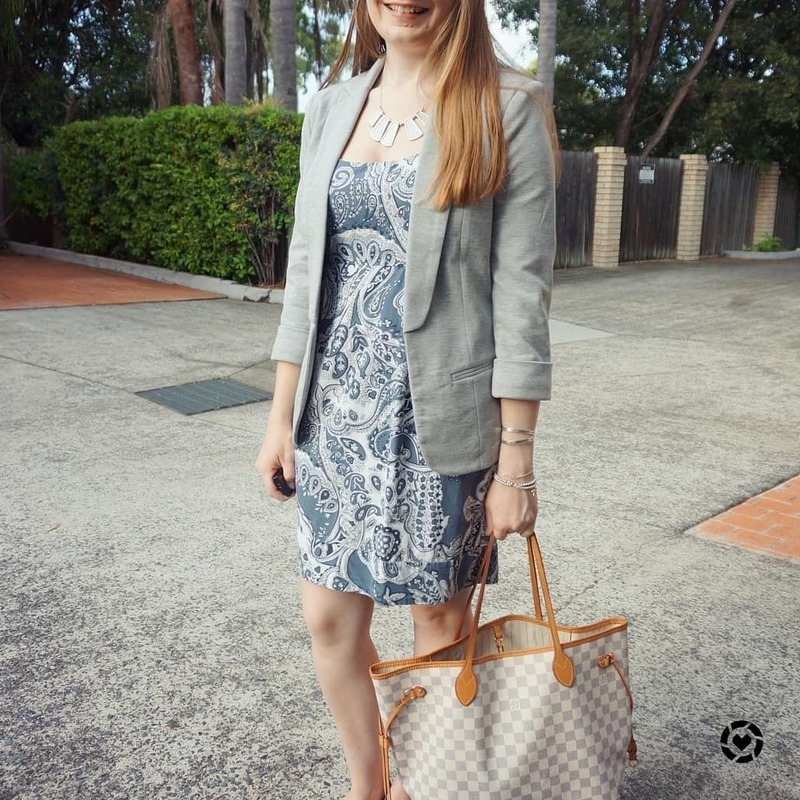 A printed dress is such a fantastic foundation to build on when it comes to office dressing and these two outfits are a perfect illustration of that! Great styling Mica! I love the way you styled the bag. It looks so cute! 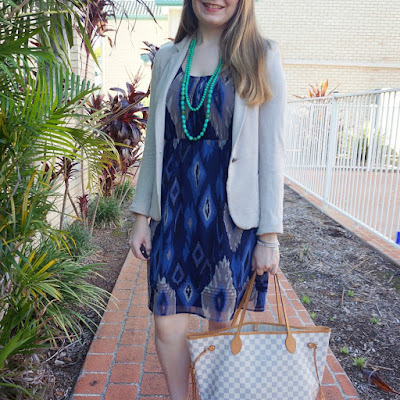 I love how your blazer instantly elevates the outfit! Both little blue dresses are so cute! I love how a blazer adds polish to any outfit--both of these looks are perfect for the office! I haven't been wearing dresses as much since it's been cold out but I need to add them back to the rotation! I love these looks and the bag. Great review video. Hope your week is off to a good start. That blazer looks so cozy and I love the light color of that bag! Hope you had a great weekend! These prints are so fun! I love the first dress on you! Such a gorgeous color! I LOVE printed dresses in the summer! It's just one easy outfit, even better to wear it to the office with a blazer! I love both looks! You look lovely in both and both are great for in the office wear. 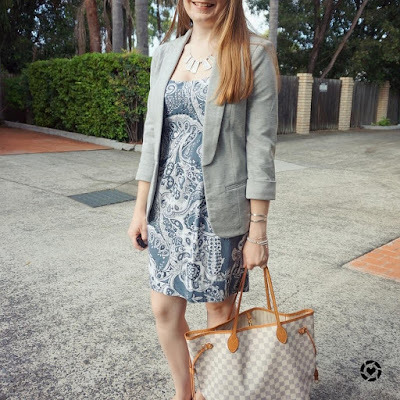 I do like the grey printed dress and blazer just a tad bit more. It pairs so well with your ballet flats and your LV bag. I dont like to wear blazers i worked on a bank and i always wear it and for me forget it never more!!! I totally agree about a printed dress being a go-to office outfit for me. Perfect with your blazers. You look chic! I wish I could afford a LV bag! LOL! Love both dresses on you, Mica! I don't think I have any printed dresses but you sure do make them look really good. Wow you are so right! Wearing a printed dress is an easy yet put together outfit. These dresses look classy and chic on you. How cute are your printed dresses?! Love! And I definitely agree about planning outfits the night before, although it was a bigger deal when I had to get up at 5:50 AM and was too delirious to do anything but get dressed! If I had to choose, I like the second one the most! That's a great palette to complement the bag. 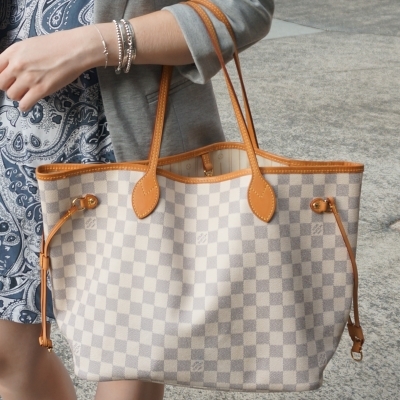 I've never tried a Neverfull as I never have much to fill it with, but I always love the look! So simple yet very appropriate looking at work. I loved the first dress and the bag and the second is amazing as well, a classic! I liked the first necklace as well, and I am always happy to see you in flats - so much comfort! Around 4 years ago, and it seems to me like a looong time, I only wore high heels to any activity - I still hear some jokes from when I went to Stonehenge in heels and everybody looked at me! But then a friend wore flats and I gave it a go - and now I am such a fan of them and wear them most of the time! You look so beautiful! Hope you have a nice week! Both these blue dresses look so fab on you, Mica:) I agree about printed dresses being a great go-to piece. And I have the monogram Neverfull and Speedy. I don't have a lot of designer pieces but these two I really do love. You can fit so many things in them! Ohhh I love these dress and blazer combinations! I'm always looking for cute ideas to wear to the office and I love these looks! I really need a Neverfull in my life, STAT! Such an awesome + timeless bag! I don't often wear blazers with dresses and I am not sure why. I just typically reach for a cardigan. But I love how easy these outfits are and how professional they look! Love the bag, I have the big size! Wow, so interesting combiantions! I prefer second, but both of them are so lovely and look amazing on yoU! Great photos darling! That tote is so practical! I love the soft blue shades it has. Definitely one that will last you forever! Both fantastic looks, Mica! I love how the blazers really make the slightly more casual dresses so great for a work outfit. You know that dresses are my go-to when I'm not feeling inspired. You're rocking this look! They are the best-go to! :) And yes, blazers dress everything up nicely! I've been adding more dresses to my wardrobe; they really do make getting dressed easy. I love both of your dresses and of course that gorgeous bag! Your bag collection is truly amazing! hehe thanks - it's printed dresses (and yes awesome bags!) that make it easy! 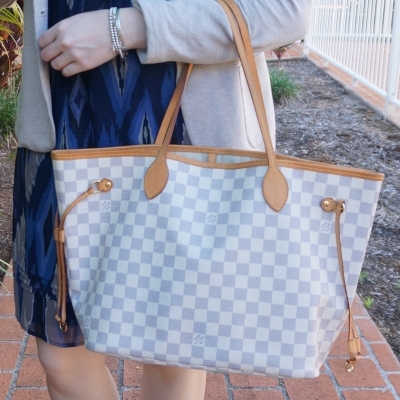 The Damier print on the Neverfull is such a classic. I think I prefer it to the monogram, it just seems to be more versatile! I think I would agree with you on the second outfit, while both are great something about the second one seems more interesting. I think it's the light colours and mixed prints with the dress and bag. While I won't rule out getting a monogram bag again, I am more of a damier person at the moment! It really helps to plan outfits the night before. You're not struggling in the mornings to find something. Mica, I love both outfits but my favorite is the second one! I think I saw it on instagram and I was like WOW it looks SO GOOD! I cannot pick a favourite ! I really like both looks. Its incredible how when we feel good wearing a garment, we make things happen!